Hundreds of Muslims have taken to praying on the streets of a Paris suburb to protest the closure of the hall they had been using as a prayer room. Protesters gathered outside the town hall of the northern Paris suburb of Clichy on Friday. The Muslims were protesting the loss of their prayer hall which the mayor, Rémi Muzeau, plans to turn into a multimedia library for Clichy’s 60,000 residents. The hall had been rented by the Union of Muslim Worship and Cultural Associations of Clichy-la-Garenne (UAMC) since May 2013, but their lease expired in 2016. A court of appeal then ruled against the UAMC, who have been negotiating with the council to keep their old prayer space ever since. As a result from taking the hall from the UAMC, 300 children now cannot attend Arabic or Islamic history classes formerly being held there. Local authorities have argued that Muslims can use the new Clichy Muslim Cultural and Worship Center (ACCCMC) that was inaugurated last year. But after visiting the new center – located next to a car pound – last year, UAMC’s supporters say it's too small and too far away. "For women, the elderly and children who travel by foot or by public transport in the evenings, it will be difficult for us to get there," Rabiaa, a member of the UAMC, told 20 minutes. "We will be out of the way and risk losing practitioners along the way." Protesters have been gathering outside the town hall for ten days now, and have vowed to stay every day until the issue is resolved. 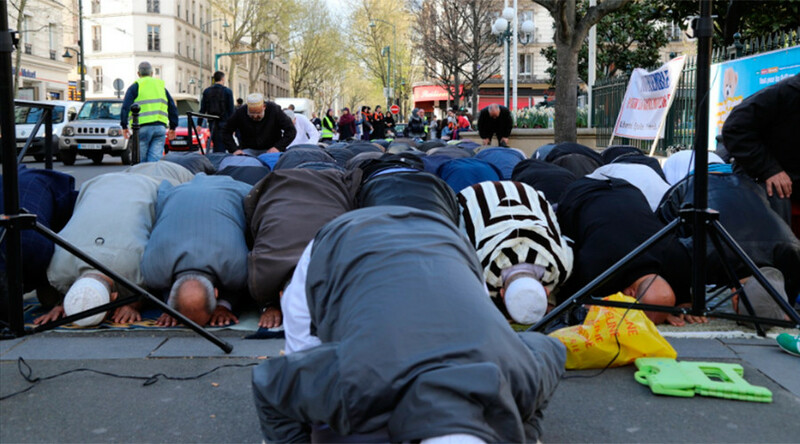 There are an estimated five million Muslims in France, and street prayers are becoming more frequent due to a shortage of mosques. Far-right presidential candidate Marine Le Pen has pointed to such outdoor prayers as an example of Muslim encroachment on French secular values.